My Homemade Vanilla Ice Cream crying chocolate for Labour day! I hope everyone in US and canada is having a great fun. Yes! Long weekend is always fun! Be it Thanksgiving or Labour Day. Even if we have not planned for a trip, long weekends do have their own way of treating us like we are in Hawaii. You are right. Getting up late, no work, even taking bath is optional. In my home, every weekend is like I am in Hawaii. I get up late, mostly will take my bath in the late evening, cook something very simple and lay in my bed listening to my favourite songs and watching TV. wow! I love weekends! Labour day weekend was a long awaited one. We thought of inviting our friends from Tennessee. But, unfortunately they couldn't make it this time. We ended up staying at home, mostly because my husband doesn't like last minute trips. So here I am sitting in my sofa, writing this post and most importantly I am yet to have my bath :). "Labour Day is an annual holiday celebrated all over the world that resulted from efforts of the labour union movement, to celebrate the economic and social achievements of workers." Says Wiki. The majority of countries celebrate Labour Day on May 1, including India and it is popularly known as May Day. Where as the US and Canada celebrate it on the first Monday of September. The holiday originated in 1882 as the Central Labor Union (of New York City) sought to create "a day off for the working citizens". Usually there will be parade and speeches by prominent people. To know more about labour day traditions, check out wiki. What is special in your house for Labour day?, you may ask. I tried out Ice Cream. Not just Ice Cream, Homemade vanilla Ice Cream! I love Vanilla flavour. The method is simple, but we need to be careful with the consistency. In a large bowl, mix the heavy cream and the half and half. Gradually whisk in the sugar until blended. Whisk in the vanilla. Refrigerate, covered, until very cold. I suggest to freeze it for 3 to 6 hours. But you can also freeze it for 2 or 3 days. Whisk the mixture to blend and pour into the canister of an ice cream maker. Freeze according to the manufacturer's directions. Eat immediately or freeze it for later use. Note: As this recipe doesn't have eggs in it, I think it will be a hit allover the world. You can also add eggs to this recipe, but I don't know how it will taste as I have never tried it. It might have the raw eggs taste in it. I wanted to surprise my husband with this Vanilla Ice Cream on Labour day. So I prepared it 2 days back. The more you freeze, the more it holds up. After eating a scoop, I wanted to try it out with chocolate syrup. I added the syrup and when I looked at it, wow! it was like the vanilla ice cream crying out chocolate tears! Loved it that way. I love this ice cream along with Beetroot halwa or carrot halwa. It is divine. Wow, that looks so delicious Sangeeth! Nice icecream recipe. i love ice cream specially vanilla flavor.i want to try it looks good.just let me know what is half and half cream - and any substitute for it in case i don't find this here. 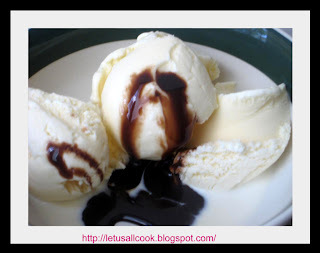 nice recipe for vanila icecraem and the chooclate sauce on it looks so good!!! Delicious icecream. The pic with chocolate tears is amusing. Lovely scoop sangeeth! And the choc sauce would give a nice kick! hi am back again after a break! am inviting u for my son amiitesh's b'day which falls on sep 3rd! the icecream is looking so good! can u send that for me to taste it? my mouth is watering! yummy yummy ice cream, never made ice cream at home, should try that.